In stock 186 pcs. Also available in our walk-in store. 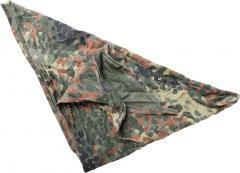 A triangular German scarf made of thin blended cotton fabric with Flecktarn camo pattern. 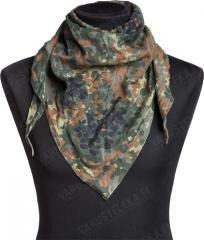 Wear on your head as a kerchief or around the neck as a neckerchief. Drench in water for additional cooling effect during hot weather. Kylläpäs Sturmilla keksittiin raivostuttavan iso ja paperinen ja yhden äärikulman särmässä liputtava pesuohjelappu, joka tököttää rutussa esillä jos tämän erehtyy päähänsä sitomaan. Nips naps helkkariin moiset. En tiedä kyllä käytetystä tai ylijäämästä tän kappaleen kohdalla, tulee vähän Mil-Tecin hyllytuotteet mieleen. Sekoite 65% puuvillaa. Kokovaltaiseksi kaalinpeitteeksi se on vähän hankalan kokoinen ja muotoinen, täydessä mitassa siitä jää aika reilusti yli piiloon ängettävää kangasta, mutta kaksinkerroin se jää hitusen liian lyhyeksi takaa numeron 60 kuupassa. Aika näppärän näköisen ja tuntuisen bandanan tästä kyllä kietaisee. There are so many practical uses for a bandana or scarf. I really like the size and material. Anyone who spends time in the outdoors should have one in their pack. This is really nice quality fabric. Nice large size. The fabric of this is great! Slightly stretchy, very soft, but thick enough to be warm and barely see through. Excellent quality and the price is cheap! I may order a few more. Sweet ! ordered 1 got 2,thanx varusteleka! Soft,stain free and dont stink like military surplus. A surprisingly useful accessory for warm weather (a merino buff is probably better for cold), lovely size, shape and fabric...I rate mine very highly and it's become a staple in my summer kit. I was actually skeptical of this purchase at first, it didn't seem like something that was so soft and thin would be as warm as it is, but it holds up to the Canadian winter, and that's something. The fabric is also a bit stretchy and seems fairly durable. The flecktarn camo pattern it sports works well with most other woodland camos, too, if you're concerned about that. It meshes well with CaDPat and M05, not that Im some super camoflauge expert or anything. It's also big enough you could use it as a dressing if you had to. All this in something half the price of a normal, much less durable kercheif over here in Canuck-land.